I remember it well. My first contact with my DHS “whistleblower” source was a middle-of-the-night conversation on May 25, 2012, some five-and-a-half years ago and well documented on this site and other sites, including Canada Free Press. That was several months before the re-election of Barack Hussein Obama, the man of questionable origins, dubious bona-fides and an inherent, visceral hatred for everything that made America a once-great nation. Obama had to win re-election to complete his task of destroying our Representative Republic. He was handily re-elected without much viable opposition, giving him additional time to complete his duties as the front man for his Globalist puppet masters. Now, let’s fast forward to the present. In an upset the Globalists did not see coming, President Donald J. Trump was elected by the people of America in a fair and free election. This, however, was not supposed to happen. After her coronation, Hillary Clinton was supposed to continue the unfinished tasks of Obama, transforming the U.S. into a fully Communist society that would better integrate with a Global collective. Bernie Sanders, a socialist, was simply not radical enough for the Globalist puppet masters of the Progressive base, which is really a Communist platform. In the wake of the loss, the Communist operatives immediately went to work to cast doubt on the legitimacy of our elections. Much like the signature Benghazi video, the Russian-Collusion narrative was birthed out of desperation and necessity. It relentlessly continues today as the Shadow Government is using the mechanisms of our institutions in the form of an “Independent” Counsel to further delegitimize our President and his office. The intended result here is to provoke a Constitutional crisis that will send our nation into a deliberate state of chaos. Meanwhile, the highly active Shadow Government, maligned as a conspiracy theory by the very people who comprise this agenda and their unwitting dupes, is in overdrive to compensate for the interruption of their agenda. Barry Soetoro, better known as Barack Hussein Obama II, is operational from his base on Embassy Row to tend to the business of taking America down from within. In fact, one might assert that he has more latitude out of office and away from oversight. Consider the situation of Dr. Sebastian Gorka who recently departed from the inner circle of the West Wing. Undoubtedly, he will be engaged in a form of political trench warfare on behalf of the Conservative Right that might otherwise be impossible. Now recall the warnings from my previous reports, based on the information given to me from my insider source. Also remember that the plans, tactics, strategies of the Globalist might change, but the objectives remain the same. The Globalist puppet masters want to tear America down. All of it. Their hatred for American is unmatched, as is their desperation now that Donald Trump is in office. Assume Control of the Reins of Power. The main problem to a ‘stable and just world order’ is the United States.” –George Soros, The Age of Fallibility. The Shadow Government has existed inside the United States since 1947-48, or since the inception of the Central Intelligence Agency. It has undergone various iterations and refinements, and now comprise, as part of the Shadow Government – a subsection known as the Deep State. The tools available to the Shadow government are many, and now involve the use of the many technologies that did not exist even a decade ago. Note: Kevin Shipp, a former CIA officer, will be our guest on The Hagmann Report tomorrow, Friday, September 1, 2017 to give his presentation on the Shadow Government based on his first-hand knowledge. One can see how far along the Shadow Government is in their task of destroying America. Nonetheless, they have an enemy in Donald Trump, who is a formidable speedbump on the road to complete tyranny. While they continue to work on step 4 via Robert Mueller and the Republican establishment, there is a level of organization and flow of money being poured into step 3 unlike anything ever before seen. Starting with “protest” marches concurrent with the inauguration of Donald Trump, the Communist resistance to a free Republic is being refined from the top down, populated from the bottom up, and fueled from the inside out. Does this sound familiar? It should, as it is from the mouth of Van Jones, a close confidante of Barack Hussein Obama and Hillary Clinton who was briefly at the center of controversy as Obama was about to give him a West Wing position. Today, Jones is a political activist and involved in numerous “Progressive” political initiatives. 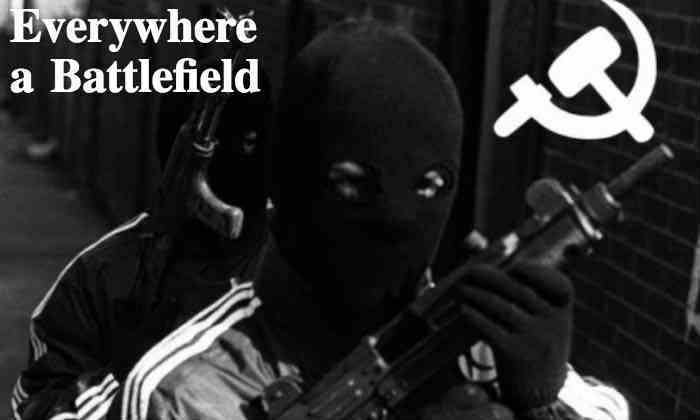 According to most recent information from my insider source within the beltway, combined with infiltration and investigation of various “activist” groups in the U.S. by investigators involved with my organization, the protest marches are being permitted to grow into an armed militant movement that will cause “flashpoints” of domestic unrest and armed conflict across the U.S.
Obama’s “fundamental transformation,” although momentarily interrupted by the victory of Donald Trump, will be facilitated by an armed resistance aided by holdovers inside government loyal to Obama, Clinton and the Globalist cause. They have had more than a decade of infiltration under Obama and the globalists, and intend to stay as long as possible. Meanwhile, they are arming for war to be conducted in the streets of America. 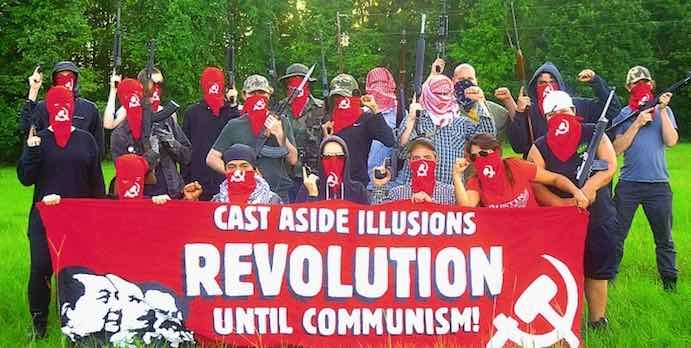 Groups including but not limited to Antifa, RevComm, and now Red Guards (Austin) are collecting weapons and preparing for an all-out assault under the pretext of fighting the Nazi oppression that they purport that Donald Trump and his supporters espouse. They are turning in their rocks and bottles for bullets and guns, and are receiving training from war veterans sympathetic to their cause. One might laugh at the thought of the thuggish snowflakes, known by their obtuse behavior, being able to cause any such violence, at least effectively. Alone and without top-down coordination, perhaps a chuckle might be warranted. However, their efforts are being supplemented by powers inside the Shadow Government, a force multiplier that we mock or ignore at our peril. As I discussed during my radio show today, war is coming to our streets as I warned over five years ago.